On our vacation last week, I offered to be the official cook and baker for our friends at the lake cabin, and no one seemed to mind. Since we were so far from civilization, the grocery list was a one-shot deal, so I had to think ahead and be prepared! One thing I knew I definitely wanted to make was Gnocchi with Summer Vegetables. This recipe was recommended to me by an old high school friend with whom I’ve recently reconnected (Hi Susan!). It was incredibly light, summery, and all-around tasty. Even my husband, who hates squash and zucchini, devoured it. This dish had the perfect balance of textures, and the lemon gave it a zing that tied all the flavors together. I used store-bough gnocchi (I’ve made them from scratch a few times and prefer the ease of the pre-prepared variety), but you could certainly make your own. You could also vary the types of vegetables, cheese, and herbs, but I recommend sticking with the recipe. Why mess with perfection? I also doubled it to feed our crowd, which worked well. 1. In a large skillet, heat oil over medium-high. Add squash and garlic and season with salt and pepper. 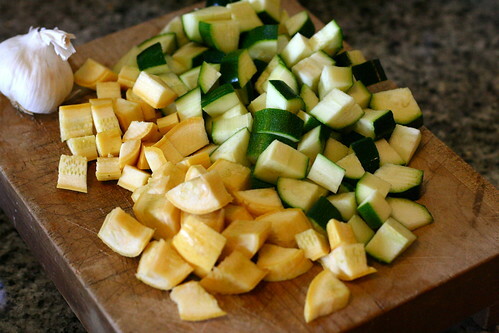 Cook, stirring occasionally, until squash is crisp-tender, 4 to 5 minutes. Add tomatoes and cook, stirring occasionally, until juicy, about 2 minutes. 2. Meanwhile, in a large pot of boiling salted water, cook gnocchi according to package instructions. Reserving 1/2 cup cooking liquid, drain gnocchi and transfer to skillet. 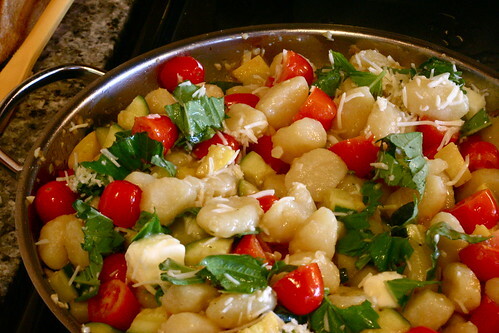 Toss gnocchi, adding enough cooking liquid to create a sauce. Remove from heat and stir in basil, cheese, butter, and lemon juice. 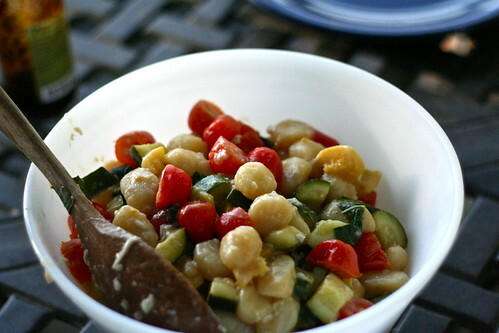 This looks like the perfect summer meal--beautiful photos!! Made this last night and it was so fresh and bright! Now I'll be making it for a crowd at a cabin next week - thanks for sharing!! Nice idea and very colorful too. Your pictures inspired me - so I made this tonight - it was amazing:) So light and perfect for a springtime dinner. I added asparagus and feta cheese and was in heaven. Thanks as always for your recipes and gorgeous pictures. Love 'em!